Google is jumping headfirst in the gaming industry, it seems, as it has been teasing its first-time participation in the Game Developers Conference in San Francisco. During the keynote, which you can watch streamed live above, Google will be laying out its “vision for the future of gaming, “Following successful trials for its Project Stream gaming service, Google will be hosting its first Game Developers Conference (GDC) keynote at GDC 2019.Big name game developers and publishers will be gracing its event such as Bandai Namco, Id Software, and Ubisoft. Furthermore, the Google has made some high profile hires such as Assassin’s Creed producer Jade Raymond and PlayStation VR engineer Richard Marks in addition to ex-PlayStation and Xbox executive Phil Harrison. Whatever Google is going to announce likely has something to do with streaming, which the company is openly experimenting with.The concept is relatively simple. What if, like Netflix and Spotify, you could not only digitally distribute games, but also stream them over the internet, so players wouldn’t need expensive hardware to play graphically-intensive titles? It’s difficult because games, unlike other forms of media, are both incredibly large in size and require real-time input from players. The idea is that you can play a fancy, pretty video game even if you don’t have the local hardware to render it because all that work is being done off-site. It’s something we’ve been hearing for a while in the gaming industry but seems like it might be finally on the verge of moving past the technical hurdles that have kept it from mainstream success. “Cloud gaming services will erode the appeal of traditional gaming consoles, leading us to believe that the next generation of game consoles will be the last,” says Matthew Bailey, Senior Analyst at Ovum. “The key to cloud gaming’s success will its ability to harness connected devices – from smartphones to smart TVs – to deliver console-like gaming experiences without the need for consumers to invest in dedicated gaming hardware. A new patent was filed last year, offers what could be a first look at Google designed hardware.The patent has a January 31, 2019 publication date, and uses line drawings to outline what is mostly pretty standard fare for a console controller. The controller offers the traditional D-pad, thumb sticks, four primary buttons, and four trigger buttons. 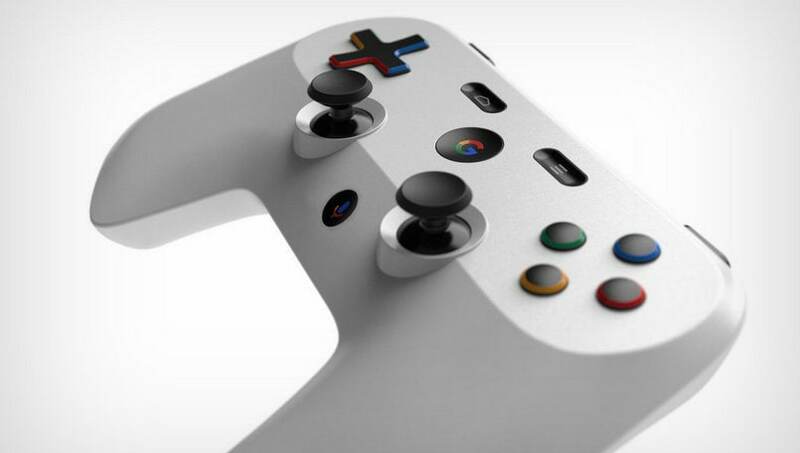 Additionally, there’s a menu button, a home button, a Google button, and a microphone button.The Reps Twitter account posted a tweet showing off renders of the controller. The renders appear to be the ones from Yanko Design, and may or may not be indicative of the final product.The patent also details a notification system built into the controller that could permit a “seamless activation of a game or other application on a host device from a game controller.” The notification system could also alert users to changes in player scores, a chat message, or an invitation. Additionally, Google says Ubisoft is another one of its partners. Uncharted director Amy Hennig, who recently left EA, will also be on a Google-sponsored panel with a representative from Tomb Raider studio Crystal Dynamics and game designer RaphKoster. Now, we don’t know what this level of involvement translates to; these companies could just be trotted out to shower Google with technical praise and show off a demo or two.